In the hospitality industry, trying to eradicate pathogens and contagions from surfaces can seem like an endless task. With so many areas to consider: lobby, check-in desk, guest rooms, restaurants, pools, business center, and gym facilities- all with multiple surfaces, how do you decide which products to use while ensuring that pathogens are being killed properly? What if there were scientifically proven pre-identified criteria designed to make the decision making process easier? There is! In a study conducted by Drs. Rutala and Weber in which they identified 5 key criteria to consider when choosing a disinfectant product: kill claims, kill and wet contact times, safety, ease-of-use, and other factors. Although the findings were applied to the healthcare industry the criteria can easily be transferred to other industries as well. The complete article is available here (subscription required). The purpose of this article is to briefly summarize the five criteria to consider when choosing a disinfectant product, identify the common mistake hotel staff make when cleaning, and suggest Best Practices when it comes to disinfecting surfaces. As previously mentioned, choosing the correct product is the first step in eradicating the pathogens on various surfaces in a hotel. Here are 5 keys to consider when researching a disinfectant product. It is important to predetermine the hospitality-associated pathogens that are most common to outbreaks and infections. Next, in order to prevent outbreaks you need to know that a product is going to kill the identified pathogens. Since kill claims must be listed on all Environmental Protection Agency (EPA) registered disinfectant products be sure to check the product label to ensure the product will indeed kill the pathogen you have identified. It is important to use a product with fast kill times to ensure the complete destruction of pathogens before a guest touches the surface. Wet contact times are defined as the amount of time the product must stay “wet” on the surface, in order to kill the pathogen, before wiping the surface dry. Contact time has been an issue in the past because individuals typically have to wait 5-10+ minutes for surfaces to be disinfected properly before wiping it clean. This length of time is not efficient when cleaning multiple surfaces, but not leaving a product on a surface for the directed amount of time means it is not killing germs. The good news is that there are EPA registered products with shorter contact times of 1-4 minutes. It is important to make sure that the products you are using are safe for staff and guests. Key questions to ask include: is the product flammable, what is the toxicity rating, and is their a need for personal protective equipment (PPE) when using the product? Additionally, products need to be deemed safe for surfaces so they do not damage them or strip off protective coatings. Repairing or repainting equipment is expensive and removes it from service. Make sure the product comes in a convenient form and is easy to apply. For example, mixing chemicals while simultaneously ensuring proper dilution invites the element of human error, which can ultimately impact the effectiveness of the product. In order to be more time efficient, choose products that both clean and disinfect concurrently. Finally, make sure the disinfectant has a specified and considerable shelf life. Other factors include whether or not the manufacturer or supplier offers customer support. Do they offer continuing education for product use? Is there a 24/7customer support hotline available so you can ask questions or relay relevant concerns? Once a hotel has chosen the best product to kill pathogens and contagions, the application process can either eliminate outbreaks or escalate them. Using the same cleaning supplies over and over again only contributes to the spread of bacteria across multiple surfaces. A better and safe way to eliminate the likelihood of cross-contamination is to use a product that can be disposed of after each use while still being cost-effective in the long run. 2XL is a leading manufacturer of safe and cost-effective disinfecting products for a variety of industries including hospitality. 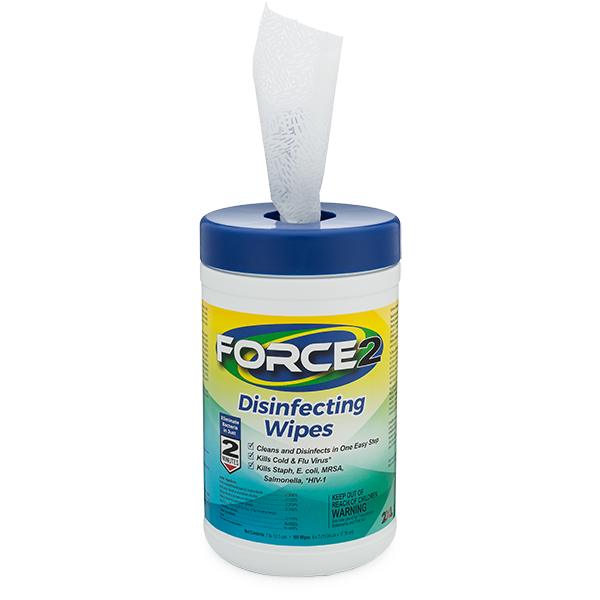 FORCE2 antibacterial wipes are the safest, most effective disinfectant on the market. Our wipes are powerful and designed to pass the most stringent cleaning standards. Most importantly, FORCE2 wipes protect guests from pathogens and infectious outbreaks.